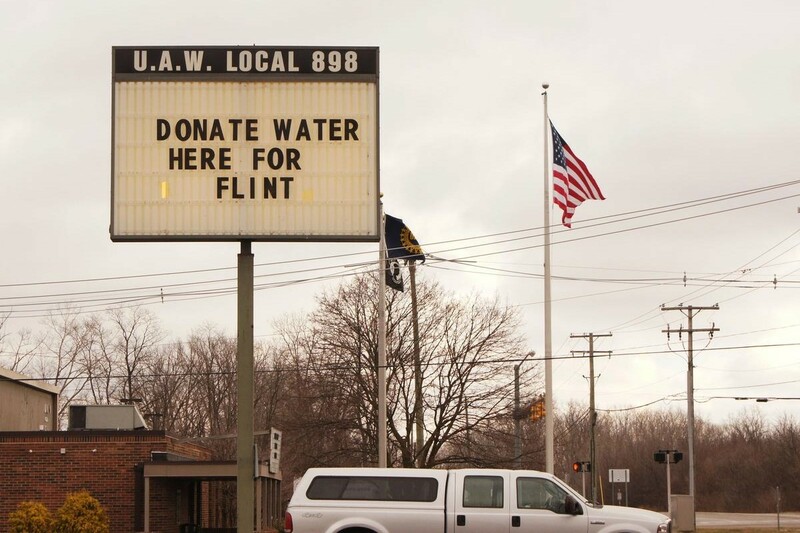 Like many cities in Michigan, and across the country, Flint found itself floundering financially and was desperate to balance the books. Its quick fix to save money by changing the town’s water source ended up costing lives and devastating the community. In April 2014, the new “cost-saving” water supply in Flint became contaminated with lead after flowing through old, corroding pipes. It is estimated that 45,000 homes in Flint have lead pipes. According to the New York Times, the Flint water crisis could potentially impact 8,000 children, who are particularly vulnerable to the contaminants. Lead poisoning can cause hyperactivity, developmental disabilities, cognitive delays and impairment, hearing loss, weight loss, mood disorders, and gastrointestinal problems. Lead poisoning can also affect adults, causing miscarriage and premature birth in pregnant women, a decline in mental functioning, memory loss, and a slew of other troubling symptoms. NPR reported on the crisis last September. Since lead poisoning causes irreversible damage, there will be lifelong consequences for affected individuals. In the attempt to cut costs, Flint has incurred unimaginable emotional, physical, and financial expenses, as it will be faced with providing services to suffering residents. Lead poisoning hasn’t been the only problem associated with the water supply. A fatal outbreak of Legionnaires’ disease has now also been linked to the contaminated water supply. Since around the time Flint switched its water source in 2014, 87 cases of the disease have been reported. Normally, there are only six to 13 cases each year. Last November, several families filed a class-action lawsuit against city officials and Michigan governor Rick Snyder. Before that time, families suffered in silence, their concerns ignored even though they persisted in alerting authorities, tirelessly advocating for their families and communities. Now the case is receiving national attention. Flint is not the only city dealing with lead poisoning and large-scale public-health crises. In Baltimore, lead paint is the culprit. In Sebring, Ohio, the Environmental Protection Agency failed to warn the town about contaminated water. Unfortunately, such crises have a disproportionate impact on predominantly black, poor areas. Advocates have even called the fiasco an example of “environmental racism.” Would this have happened in a white, upper-class neighborhood? Marginalized populations are easy to ignore and neglect. Solo Moms are already marginalized and struggle to feel heard and understood, and exacerbating cultural biases are logistical considerations. Solo Moms can struggle to make ends meet, often wishing for more hours in the day to spend with their children. Many don’t even dare to devote time to or resources on themselves, prioritizing their children and household. Add a water crisis to the mix, and Solo Moms can have even less of a voice than other members of their community. You deserve to have a voice. Oftentimes, Solo Moms are pitied and not necessarily viewed as peers or equals, and it is easy to feel small and irrelevant. Realize you do matter. Do not let that type of attitude silence you. Find helpful people in the community. Elected officials and bureaucrats can also be (or appear to be) inefficient and callous. Many professions are bound by the duty to support and protect the health and well-being of the community. Talk to your pediatrician or primary-care physician, or to a social worker. Some attorneys and law schools offer free legal advice. If you need to go that route, low-cost resources are out there. Allow friends and family to lend their support. Between child care, household logistics, parenting, and work, your life is stressful to begin with. If a crisis arises, enlist help from friends and neighbors. You aren’t weak or needy if you accept support and help. It just means you are part of a loving community, and you are not alone. Make your home safe. Do you live in an older home? Has it been tested for lead paint? Water is not the only potential source for lead poisoning. If you rent, your landlord might be required to pay for the testing and necessary repairs. Beyond lead, exposure to cigarette smoke, accidental encounters with cleaning products, and poor food-safety practices can all present dangers to children. You might not have much control over certain environmental hazards in the community, but there are things you have control over at home. The Flint water crisis is terrifying but also a good reminder to be vigilant of potential dangers at home. Communities should be able to trust that their drinking water is safe—not poisonous—and for Solo Moms, public-health crises like the one in Flint can be very stressful and generate anxiety. Many environmental toxins and instances of government mismanagement are beyond our control, but there are still ways you can advocate for yourself and protect your family.